Inspires thy counsels, and thy toils attends. And edge thy sword to reap the glorious field." assigned to her by her parents who determine the realm at conception. know the goddess is to know the realm. In the previous quote a drug seems part of the transformation. The knowledge of the drug is what the goddess posseses. How is works is a matter of the laws of Nature as set up by Zeus or some other lesser deity. The drug then gives Circe access to the nature of another realm. unaffected by her powers. But when she was released she had full control of her realm. A goddess lives beyond time and perceives all time at once. A goddess is not allowed to reveal her knowledge of the future except on special occasions and in encrypted form. Zeus enforces this rule so that gods maintain their divinity and men cannot get hold of it. threads together. What the goddess does is know what the possibilities are. she can then change the thread that the individual follows. A goddess rules her realm a a mortal monarch would rule. Within the boundaries of her realm she learns what happens by flying around and viewing events. She has issued rules for her realm and watches our for when those are broken. Some transgressors must be punished. She must also hold court and listen to petitions from her subjects. These come in the form of prayers. She must decide if the petitions have merit and what retribution is appropriate. Laws may be changed or the thread of life of a subject may be changed. The goddess Iris with her wand flying through the air. Of the goddesses only one can make errors, Ate, and she is confined to live among men. Nicias - The best thing we can do for the moment is to throw ourselves at the feet of the statue of some god. Demosthenes - Of which statue? Any statue? Do you then believe that there are gods? Demosthenes - What proof have you? Nicias - The proof that they have taken a grudge against me. Is that not enough? Demonsthenes - I'm convinced that it is. 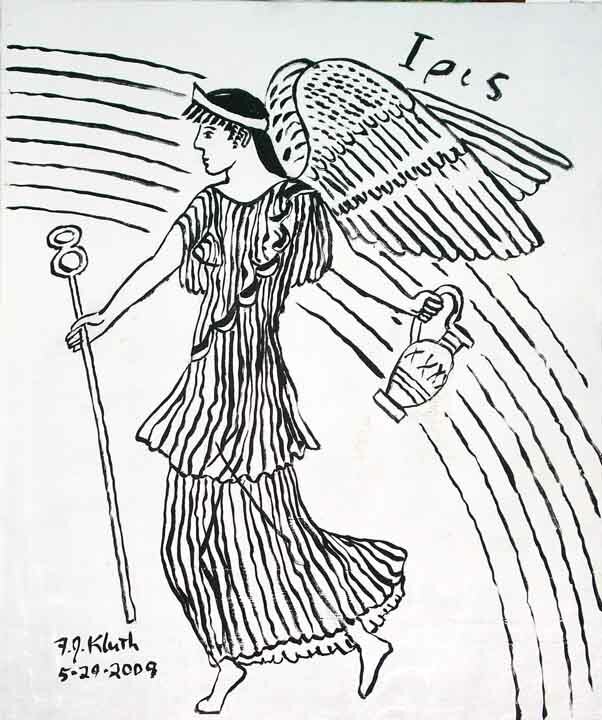 Plato states a number of important properties of goddesses after he proves the existence of deities: Plato, Laws, 907b, “May we now say that we have fully proved our three propositions,—namely, that the gods exist, and that they are careful, and that they are wholly incapable of being seduced to transgress justice?” The implication of the word careful is that they care for mankind. δι̂α θεάων – ‘divine goddess’ The word dia is the feminine of ‘dios’ which means god and comes from Indo-European ‘deiw-‘, ‘ To shine’. Th word ‘theaon’ mean goddess and is the feminine of the word ‘θεός’ which means ‘god’ and comes from the Indo-European ‘dhes’, ‘divine or theistic’. Question: Do you have any pictures of the crowns that goddesses wore. But, in general goddesses did not wear crowns. In the end of the Odyssesy Athena wears a thing like a crown on her head that actually glows. Some translate it as a lamp. Question: I know that Helen couldn’t have surpassed the beauty of a goddess but could she have surpassed the beauty of a nymph? Answer: Helen was the most beautiful woman of her time, and maybe of all time, but what does this mean? There is a suggestion that the reason why she was was so beautiful was so that she would cause a lot of trouble. But is true beauty good or bad? If beauty is associated with a goddess it must be good. Odysseus says that Penelope is less beautiful than Calypso but he loves her more anyway. Hesiod seems to think that the beauty of women is a trap for men that would lead them astray. Paris is supposed to judge the three goddesses but this is really impossible because they are perfectly beautiful. Instead he judges them on their gifts and he decides that the gift of love is more important than wisdom or social position. He is cohabiting with a nymph Oenone who he sets aside when he obtains the love of Helen. It is possible that the beauty of a women cannot be compared to that of a nymph or a goddess. Women can have beauty that is good or bad but a nymph, being immortal, must have only good beauty. This kind of beauty might not be as exciting as the beauty of a woman. A man might prefer a real woman just for the excitement value. There is no substantial difference between a nymph and a goddess. There is a difference in scope and status though. A goddess like Athena or Aphrodite has a realm that is conceptual. Lesser goddesses have realms that are actually territorial. This includes goddesses such as Europa and Asia. The less important the goddess the smaller the territory. The least important goddesses have very small territories such as a spring or a tree. Nymphs are goddesses with small territories. This heirarchy is evident in the Odyssey where the Nymph Calypso has a palace staffed by the lesser Nymphs of the Island Ogygia. lowest serving. An ordinary woman was not so different except that she was always subject to her husband. The role of a wife was to bear and raise children, but she also often commanded female servants. The sphere of influence was more domestic, confined to the house, but still a sphere of influence. One difference was in the matter of mortal petitions. Mortals could petition a goddess. The goddess would then have to determine the suitabilty of the petition and act on it if it was favorable. Mortal women has no such role.